Saint Laurent has finally designed the cool girl’s quintessential roller skate. Imagine skating down Venice Beach in a pair of high-waisted denim shorts and these bad boys. Channel your inner Lana Del Rey below. What do you think of these roller skates? A while back, Trends & Tribulations started the ABC’s of beauty to help educate readers on the many weird, bizarre, and overall unknown ingredients and products on the market. We continue on this segment with the letter B. Essentially a supercharged foundation, this tinted “beauty balm” blends moisturizer, sunscreen, primer and foundation into a do-it-all complexion product. Benzoyl Peroxide is a bacteria-fighting ingredient found in skincare products to treat acne. It’s made in the scientific laboratory by treating hydrogen peroxide with benzoyl chloride. It is usually found in 2.5 to 10 percent concentrations in acne treatment products. BHA is a oil-soluble substance that works by exfoliating deep into pores to make room for regeneration of new skin. It is generally less irritating than alpha hydroxy acid. It works best for acne prone skin, since it is soluble in oil, vs. its counterpart, Alpha Hydroxy Acid (AHA), which is water-soluble. It can make skin sensitive, so be sure to wear a broad-spectrum sunscreen when using it (keep scrolling for more info). A tea containing vitamins, (B2, C, E), minerals (magnesium, potassium, zinc), polyphenols and tannins. vitamins (B2, C, E), minerals (magnesium, potassium, zinc), some essential oils, polyphenols and tannins. Polyphenols are natural antioxidants that neutralize free radicals. Tannins protect our bodies and skin from environmental stressors, such as pollution and UV radiation and are known to fight bacteria. Part of the B complex vitamin, also known as vitamin H, it aids in cell growth and production of fatty acids, promoting healthy hair, skin and nails. It is found in products, but can also be taken in pill form. Botanical means plant-derived ingredients in skincare products, haircare and cosmetics. The types of plants they originate from include herbs, roots, flowers, fruits, leaves or seeds. They are most notable for their anti-inflammatory properties, which can benefit sensitive skin with rashes, breakouts, sunburn, eczema, redness, and uneven texture. They are also beneficial to use post-procedure, whether that is a chemical peel, laser, or anything else. “Brightening” is a term for products that reduce skin redness and uneven pigmentation, typically using ingredients like salicylic or kojic acid. Product that protects against the sun’s UVA and UVB rays. The SPF number essentially measures how much a sunscreen protects you from sunburn, which is caused solely by UVB rays. UVA is a longer wavelength of sunlight & it consists of 95% of all ultraviolet radiation reaching the earth. Therefore, a broad-spectrum sunscreen is an extremely important product to have to protect your skin from wrinkles and sun spots. Do you have any other questions about products beginning with B? Share in the comments section below! Halloween always comes up unexpectedly. If you are going to a costume party or going out this weekend, here are 12 DIY costumes you can easily put together using items you most likely already have around. Turtleneck Sweater + Vampire Teeth = Drake-ula! Vetements, pronounced vet-MAHN is the cool-girl, underground brand that debuted with a boom in 2014 (despite Lorde’s twitter feed officially calling the brand “uncool” back in May). With a selection of hoodies, quirky t-shirts, and other miscellaneous items of clothing. Additionally, they make some badass boots. See below. I can’t think of a better way to channel your inner street starlet than the look below, socks and all. What do you think of these boots? How would you style them? A pair of perfect black boots are basically quintessential to each winter. Gucci has made an extremely enviable pair this season, complete with their signature navy and red canvas panel and gold pearl embellishments. Wear them with cropped & flared culottes and a tied neck scarf for a perfectly polished, french-inspired look. What do you think of these boots? How would you wear them? Fall is upon us, and with each new season, there are new and exciting fashion trends. While we are watching the runways for the upcoming Spring and Summer 2017 shows, we are nonetheless shopping for the latest fall fashion trends. Here are the top 5 trends you’ll be seeing this season that you’ll want to wear already. The 90’s are back in full force. Think flannels, slip dresses, deconstructed denim, patent leather trench coats, and oversized cardigans. Unless you’ve been living under a rock, you’ve probably noticed that chokers are everywhere. Suede & velvet boots, paisley prints, intricate embroidery, and oversized flares are all Bohemian, 70’s-inspired staples. There’s no denying that Hillary Clinton may have been the inspiration behind this emerging fashion trend. Think bright colors and patterns to give a fresh and fun vibe to the pantsuit. 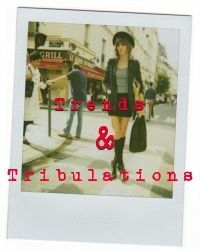 What are your favorite trends of this upcoming fall & winter season? Share your thoughts in the comments section below.